Once only the domain of the inner-city dweller, penthouses, typically the top floor of a prominent apartment building and reserved for only the very highest of fliers, are now emerging in some of Sydney’s outer suburbs. Think ‘penthouse’ and often the first thing that comes to mind is a movie-ready pad high above New York’s Central Park. And in fact, New York was a pioneer of the earliest penthouses. But far from being created for the rich and famous, these often tiny spaces, tucked between the top of the apartment building and the water tower above housed the family’s servants – and both were advertised as a luxury. By the mid 1920s, the city’s young bohemians and creatives were first to twig to the perks of the high-up perches, followed by titans of industry and the city’s elite. Basic dwellings were transformed into far finer offerings and by the late 1920s it was a rarity for apartment buildings to be built without penthouse accommodation. Fast forward to 2018 and all over the world we have eye-boggling luxury accommodation, this time reserved without question for the often globetrotting, ultra high-net-worth individuals, aka UHNWIs. As a global city, Sydney is no exception to the trend, powered by its long burst of new development and proliferation of apartments running the length and breadth of the city. But there’s another evolution taking place – just as New York saw in the 1920s, the ‘who’ of penthouse living has changed as prominently as the ‘where’. While the core perks of living in a penthouse – sweeping views, privacy, vast amounts of indoor and outdoor space and, of course, the best address in the building – haven’t changed much, penthouse buyers have become a far more eclectic crowd. While Sydney’s CBD and its new, luxury residences break price records, and Parramatta’s CBD follows suit with a raft of penthouse options amid its apartment boom, in suburban areas like the Sutherland Shire or The Hills - more used to large houses on even larger blocks - apartments are becoming the new normal. With the hard graft of raising a family done for the most part, couples are reconsidering their need for the family home. Apartments and their low maintenance, more efficient lifestyle appeals and more and more. And for some among them, re-sizing means looking at the privacy and exclusivity of the top-floor option of the ‘home in the sky’. Though traditionally a penthouse referred to a single apartment and roof terrace that together occupy the entire top floor of a building; in practice the term is often deployed more loosely to describe large upper-level apartments. “In the past, top-floor apartments in most suburban locations were likely to be just another three-bedroom apartment like the ones on the levels below,” McCarthy explains. “But now the expectations of purchasers are far higher which is forcing developers to lift the bar in their design and lifestyle offering.” Not only does luxury run to fixtures and fittings but in some cases, it’s the ability to customise a design before it’s built that makes it all the more valuable, he says. Buyers, particularly those downsizing from large family homes, often ask architects to reconfigure internal layouts to accommodate a butler’s pantry, media room, study or additional living area, says McCarthy. Several purchasers in the resort-style Woolooware Bay have added spas to their private terraces, while another requested a private rooftop swimming pool with a glass wall. When it comes to designing penthouses though, sometimes it’s the subtle details that matter most like providing a private lift lobby or, for the well-travelled buyer, having access to hotel-style facilities such as a concierge, swimming pools, spas and gyms. “At Woolooware Bay we have introduced a level of exclusivity. The waterfront location warranted an innovative design solution that would be truly memorable”, says McCarthy. In The Hills district, where pockets of apartment living culture are emerging around new infrastructure, so too has the opportunity for penthouse living. Capital Corporation’s Esplanade Norwest includes penthouses ranging in size from 144 to 171 square metres. They come with butler’s kitchens, studies, grand master bedrooms, and views of the Blue Mountains on one side and the city on the other. 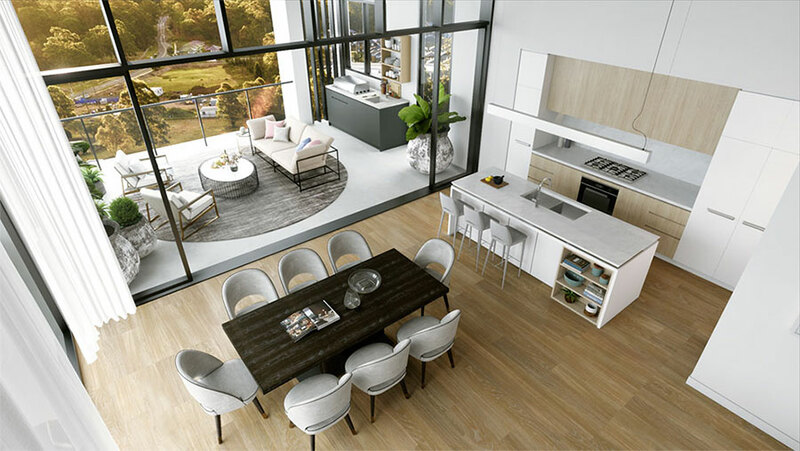 David Inkster, Director of real estate agency PRDnationwide Norwest, says as with Woolooware Bay, penthouses sold so far at Esplanade Norwest have been snapped up by local downsizers wanting to stay in the area, close to family and their community. “Some purchasers came from big homes with plenty of land – one had a five-acre lot in Dural,” Inkster says. “If you’re downsizing to an apartment, a penthouse can give you that feeling of space and privacy but without the maintenance that comes with a house and garden. All the amenities of a resort are on your doorstep - restaurants, shops and swimming pools.” Penthouses are also attracting buyers looking for a convenient lock-and-leave home. “Many wealthy baby boomers are now reaching that stage in life when they want to travel the world or visit family and friends overseas, sometimes for months at a time,” says Inkster. Today, penthouse buyers expect access to hotel-level amenities, perhaps a waterfront location and certainly top-quality fixtures and finishes such as solid timber cabinetry and flooring along with natural stone tiles. These ‘homes in the sky’, whether in the city or the suburbs, are no longer only about status. They promise a lifestyle that, in a competitive market, developers must strive hard to deliver. Read the Daily Telegraph’s coverage of this phenomenon featuring Esplanade Penthouses the latest craze to hit suburbia.